Went to have a look at this old one the other day. 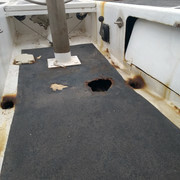 As we stepped on board the broker put a hole in the cockpit. At that point our offer halved. The deck needs to be blasted and epoxied. My main concern is the damage outweighs the saving and it may take a lot longer than anticipated. Were offering 10k. 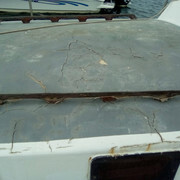 Is it worth the effort to survery and fix up knowing that were actively looking for a project boat? We like her but she needed a bit of work and now with the new cockpit information she may need much much more. for me, this boat is no longer a "she" but an "it"
Hi, IMHO if you paid 10 for it you will probably have to put another 20 into it whereas the same amount of money spent wisely would give you a far better boat almost ready to go. Check out the thread boats under 30 grand. There is a 39’ Breuce Roberts sitting in our boat yard. For sale for a while, not moving. Very nice pilot house design with a very odd interior that would work for us but not normal people. I thought I might offer him $20k. All stuff I can do and afford. I did a back of envelope estimate. I’ve done a lot of estimating in my life, I’m not too bad. The labor was the killer. I don’t want that kind of labor investment. At 68 I’ve other things to do with my time. Now that was a fair bit nicer boat than the one you are looking at. LOL, welcome back Juggles. First of all I think you need to get your hearing and eyes tested. You were given sooooo much advice in your last thread about what to avoid when looking for a boat yet you seem to insist on finding the worst boat you can and falling in love. That Columbia 34 I recommended is a 100 times better that this yacht. Did you say the owner is giving you 10k to take her away? Even then I would hesitate to touch her. What is the resale on a 54 year old steel yacht? I am not a boat broker but I bet it is close to zero dollars unless a woody duck like yourself appears. Just getting the rig back into shape is going to be 10k, that mast looks like it has not seen any maintenance in years? The interior steel work at the bow looks good but what is behind the rest of that bl**dy awful interior? I can see why you said in your last thread that you clash with your father. He must be shaking his head at this gem you found. The end of the day Juggles just buy the yacht get burnt out and scrap her or spend way to much restoring her and ending up giving her away for 5k. Then you might start listening to the wealth of advice being offered on this forum. You could also start another thread “People who brought a steel wreck and actually went cruising” it would be interesting to see how many success stories there are. I would give that one a pass...just my .02. The engine in the '65 Phillips might be worth $5K. (Half your original thought of offering $10K.) If the cockpit sole is rotted through, (in several places!) water is getting inside the steel hull in places that are not easily accessible. Rust never sleeps. Maybe that would make it easier to get the engine out - it might fall out the bottom if you have the boat hauled. Are the deck/cabin trunk steel or ply? Mediocre interior woodwork also shows signs of water ingress. The few pictures of the rigging are not reassuring: aged and rusty. Perhaps you could use the engine in another boat that was a better prospect. This one, when new, might have sailed well enough, but to get it back into use sailing might cost more than building a new boat. It doesn't seem to have a pedigree (Sparkman & Stevens,Nicholson, Reichel-Pugh, Fife, Holland, Van de Stadt...) worth that much investment. Or that much time. The DIY plywood and polyurethane interior looks (to me) like it needs to be gutted to the hull. The DIY electrical and cables would lead me to be suspect of 100% of the electrical. If it were just grinding and painting that would one thing. The lack of maintenance on every observable system leads me to believe that everything will need to be maintained or replaced. This is a great way to invest 50K+ into a boat that will be worth 20K when you're done. To me, a project boat is one that appears 'ready to sail' until to you get into it. Anything billed as a 'project boat' is typically a means to get you to pay someone to haul away their garbage away for them. You probably need to get some practical experience. Buying this boat would give you that, but at a huge cost in money and thousands of hours of labor. Yeah to be honest that was my general thought that it was too far gone but figured I'd check anyway. Thanks guys. It's great that you have the ambition to take on a project boat, but trust anyone who has actually done it - almost ANY used boat is a project boat. Find something in the best condition possible for what you can afford, and plan on spending at least the purchase price over again in repairs and refurbishment. They all need work, but anything with rotted deck laminates, completely trashed out cabins, repeatedly patched up electrical systems, or rusted steel hulls is a HUGE project. HUGE. Almost a black hole of work. It can be done, no doubt, but it is a LOT of work, especially for someone with no specific experience. There are a lot of boats on the market, but I'd leave the bottom 1/3 of the used boat market alone - if you actually want to finish the repairs, and still have any money, time and inclination left to sail it in the next 3 years. Don't start at the bottom of the market and work up - start at the middle of the used boat market and work up. Those are truly the best bargains, money and time wise, in most cases. Refurbishing a used boat and implementing your own custom ideas is a great experience, but you really need to start with something that is not just a black hole of problems. Good luck & check out some of the specific used boats others have mentioned in this and other threads. Yeah I did enquire about it the seller wasn't willing to deal with transport and then when I went about it myself I was quoted 9k. It seemed ridiculous at that point to deal with a grumpy seller and that transport cost. It's not that I'm not listening to what's being said I'm just having a tough time finding something in dinky Adelaide the home of small fishing boats it seems. I never even looked at the bloody mast. For the love of God that was dumb. And to be honest I found the interior kind of charming and quaint albiet messy. To be fair I'm not after a forever boat as long as it lasts five years I break even and have enough to buy another. You're right though about the "how many people bought a wreck and went cruising" I can be far too ambitious sometimes forgetting the limitations or reality haha. Thanks for pulling me back down to earth. Thanks. I have decided to up the budget for initial outlay and decrease the repair budget. This is also due to the time factor. The sooner the boat is done the sooner we get to quit our jobs so three years? Not so appealing haha. I figure I've learnt everything else in life by muddling through, asking learned friends or using YouTube lately so I'd do the same here with the boat. I learn best and quickly by being thrown in the deep end with no way out but through. Gotten amazing results in life so far(hence being able to quit at 30 and do this) Noticing in the boat regard though should probably look at how deep that deep end should really be. 3-5 years ago my best mates friend offered me a 30 or 32 footer free. Included a rig that needed raising, a new Penta that needed installation, a sound vessel. I don't know whether I should have gone that way or whether I'm doing correct and waiting.. She'd beat like a dream. That boat looks rotten. Some fruit you can't eat. My mates friend isn't an idiot.. He had medical issues and knew ownership with very good respect. To buy a boat is to purchase the responsibility to maintain a vessel. I believe she was gifted to a sailing club to be continued with the gift of love. I don't understand why people neglect a tool that will keep them alive in a location they'd otherwise not survive. She looks like lots of work. I know not much. Best trick I learnt is to double hitch a clove hitch.. Enables the storm covers to tighten and knot against loosening.